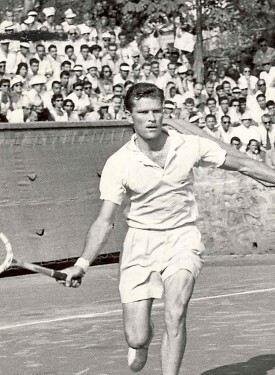 Born in Arkansas, J. Edward “Budge” Patty received his tennis tutelage in California, and then moved to Paris when he was in his twenties. No matter where he played, Patty was a spectator’s delight. A remarkable all-court player with an exceptional forehand volley, he won the French Championships as well as Wimbledon in 1950. He stopped Jaroslav Drobny in a five-set final at Paris and overcame Frank Sedgman in the Wimbledon title match. Patty’s grace and regal demeanor made one think he belonged on a court of royalty rather than a tennis court. Events, news, offers & more! Register for our Email Updates.